Wow. It’s the day after Thanksgiving. We ate, we drank, we ate some more. And man, today, I’m not hungry AT ALL! 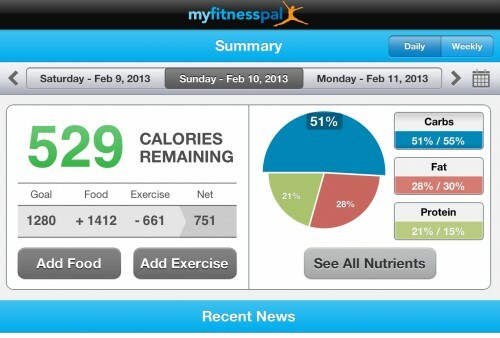 Yesterday I didn’t keep track of what I ate. Part of me is glad. Did you know the average adult consumes about 4000 calories on Thanksgiving? Not sure if I did, but it feels like it. So, what to do the day after. Well, I’m working out for an hour and I’m getting back to keeping my food diary. I know, I know, like I need one more thing to do. But seriously, when I’m trying to lose weight (and I do this a lot), there’s been strategies that work and ones that don’t. What always works is keeping track of what I’m eating and drinking. And there’s no better way to do that for me that Fitness Pal. Mostly because I can use multiple devices, and I’m pretty boring. So once I’ve put a meal into Fitness Pal, it’s there forever. Sure, a notebook would work, but I’m a geek at heart. 🙂 So I guess this little fitness tip is doing double duty for Techno Thursday. Try it out. It’s easy…and the results are nothing to sneeze at.